Staff photo by Connor Cummiskey Maggie Sheppard with Know the Truth spoke with students Wednesday about the damage drug abuse can cause. Two recovering addicts shared their stories of struggling with drug abuse before they entered the Adult and Teen Challenge to start on the path of recovery. NEW ULM — Local students heard from recovering addicts Wednesday about their struggles with drug abuse. 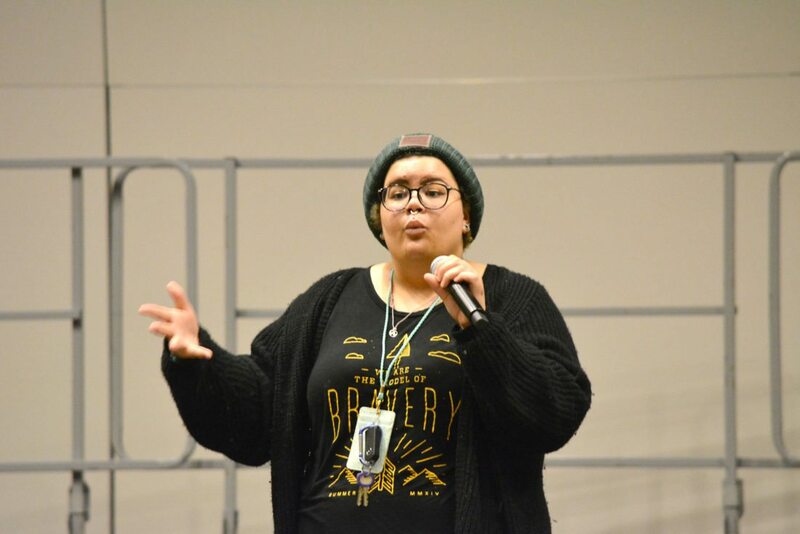 The Underage Substance Abuse Coalition (USAC) sponsored Know the Truth, a prevention and outreach program, an effort to speak in area schools and share stories of drug abuse. Jeremy Sutliff’s struggle with drugs linked back to his four-year-old brother, who died from cancer while Sutliff was in middle school. As a result, he refused to open up and isolated himself because he did not want to be known as the kid whose brother died of cancer. Sutliff had been into skateboarding and while hanging around the skate park was pressured into trying marijuana by some of the high school students he looked up to. Eventually his drug use became a habit and escalated to prescription pills. He went to St. Cloud State University but dropped out. For a time Sutliff worked as a kitchen manager, to make enough money to feed his habit. Once he lost that job, he began pawning his possessions: skateboards, game systems, anything to fuel an addiction to pills. He got busted by his parents, who he was living with, when he stole $200 from his mom using her debit card at an ATM. After his dad caught Sutliff, he learned about his son’s addiction and said he did not want to lose another son. Sutliff got into a 12-month Minnesota Adult and Teen Challenge program and worked to get clean. The other speaker who shared her story was Lindsey Miska, who entered the Teen Challenge program on a court order. Miska had struggled with depression through high school after her dad was killed driving home. She was a top student, focusing on academics and sports, but got hooked on a Percocet prescription. Her addiction resulted in Miska getting a DWI, losing friends to overdoses, overdosing herself twice and contracting hepatitis C.
She was ordered into the Teen Challenge after she sold some Percocet to a friend who overdosed and died. At 17-years-old Miska was facing down serious jail time when the judge decided to order her into the Teen Challenge program. There she struggled and almost got kicked out once for using drugs, but after 18 months she came out of it and started working with Know the Truth to share her story.